The Solent Sunbeam Class enjoyed beautiful weather at the 30th running of the Henry Chisholm weekend at Itchenor Sailing Club. Glorious sunshine and light winds were evident for all four races. It is always one of the best-attended events in the Solent Sunbeam class. Sir Henry Chisholm was instrumental in growing the class at Itchenor in the 1960s and contributed greatly to a class which this year is celebrating its 95th anniversary. Twenty Sunbeams raced and the light winds combined with sailing over the high tide meantthose finding the best breeze were rewarded for their skill. In the first race, V41 Fleury sailed by Joe and Cathy Burnie led from the start. This is the first time we have offered an accessible sailing experience at Itchenor where boats can be hired for use. The open day was the perfect way to officially celebrate the launch of the programme and we received a very positive response. Roger Wickens sailing V26 Danny stayed out of the adverse tide the longest and came second as a result. In the second race V14 Jabberwocky sailed by Mike Weston took an early lead which he extended to win by a considerable distance. V26 Danny pulled through for another second and V18 Polly sailed by Nick Leach and Martin Evans finished fourth. The second day of racing produced almost-identical conditions. In the first race V36 Melody sailed by John Ford got to the first mark in the lead but was overhauled by eventual winner V26 Danny. In the final race V26 Danny had a big lead at the first mark which was held to the end. V41 Fleury took second and V68 Sky sailed by Ollie Gilchrist and Becky Wickens was third. Roger Wickens won the Henry Chisholm Trophy having sailed a consistent series. Joe Burnie in V41 Fleury took second and Mike Weston in V14 Jabberwocky was third. The class is looking forward to its 95th anniversary weekend at the end of May. Overall results: 1 V26 Danny - Roger Wickens, Tim Martell, Jacky Wickens; 2 V41 Fleury - Joe & Cathy Burnie; 3 V14 Jabberwocky - Mike Weston, Peter Hansell, Peter Dickinson. Itchenor hosted an open day to launch its new 2000 dinghy sailing experience. The highlight was the launch and official naming of the club’s new 2000 dinghies. The winning names – Zephyr, Skate and Mako – were selected in a competition involving schools and the general public. Pam Clarke, Frank Frizelle and Barnaby Curwood provided the winning suggestions, and each received one month’s free membership to the club and a neck gaiter from Rooster Sailing. The RS2000 dinghies form part of the new 2000 dinghy dailing experience at Itchenor, a new membership initiative to encourage fun, flexible and sociable sailing open to all. The dinghies are available to hire on a full or half day basis, giving members the opportunity to learn to sail or brush up on their skills without having to own a boat. Designed for families, couples and individuals looking to get involved in the sport for the first time or those wanting a stepping stone to get back into sailing, the 2000 Experience comes with weekly activities and events including training, cruising, beach picnics, racing and regattas. All those interested in joining this relaxed sailing programme at Itchenor can enjoy a special introductory members’ offer for the first year and free first use of one of the Club’s 2000 dinghies. Those who have yet to reach the required level to take a boat out on their own will receive a free half-day training session, or they can join one of the various RYA training weekends the club run. Bognor Sailing Club are holding an open day this Sunday (May 20) as part of the national Push The Boat Out month. It starts at the Victoria Rd South club at midday and runs until around 3pm or 4pm and there will be a number of activities available for people to try free of charge. You can be taken out on boats, or try windsurfing or kayaking – and there will be a windsurfing simulator on the lawn for those who don’t want to get too wet. Buoyancy aids and other safety equipment are supplied so people just need to turn up and sail. There will be a special PTBO weekend membership deal for new members. The bar will be open for refreshments until 8pm; food will be also available. 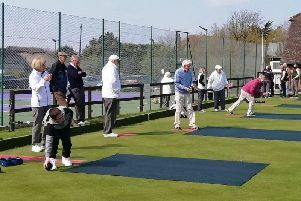 On a sunny morning, Felpham Sailing Club hosted intrepid would-be sailors at their annual RYA Push The Boat Out event. Some 25 visitors aged from eight upwards all had an opportunity to ride a powerboat and a sail a dinghy. Everyone had big smiles as they came off the sea having had a great experience – for nearly everyone it was their first time sailing. Many taking part expressed a desire to learn to sail and join the club. Thanks went to the many club members who made the event a great success. Without the safety-boat team, helms, shore team, greeters and kitchen team it could not happen. If you are interested in learning to sail or joining Felpham Sailing Club please drop in at our Blake’s Road location any weekend or on weekday evenings (except Mondays). Please check the website www.felphamsailingclub.co.uk for event/opening times.